And of course if you need any help with anything SmugMug, check out the many support forums available! Still looking for more? Here's [post=1620148]What's Happening[/post]. SmugMug is a great photo service that lets photographers share, sell and manage their photos online. Digital Grin was created by SmugMug for the love of photography, giving shooters all over the world a friendly, open community to share and learn. 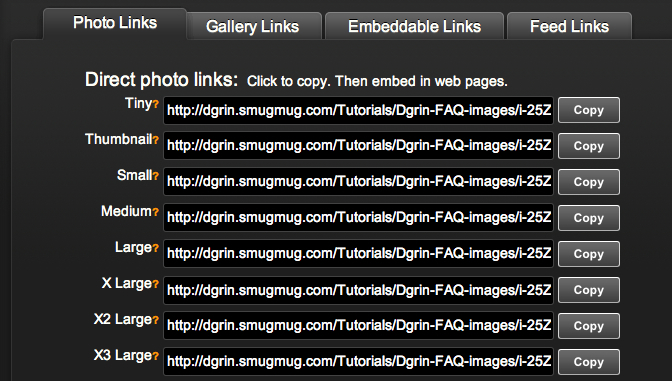 While Dgrin is hosted by SmugMug, it's run by volunteers whose goal is to create the best photo forum on the net. You don't have to be a SmugMugger to join up on Dgrin, but if you are you can always drop by their support forums for help with your website. There are three icons at the bottom of every post. Reply creates a new reply with the current post quoted. Multi-quote toggles the post on/off for inclusion in a multi-quote post. 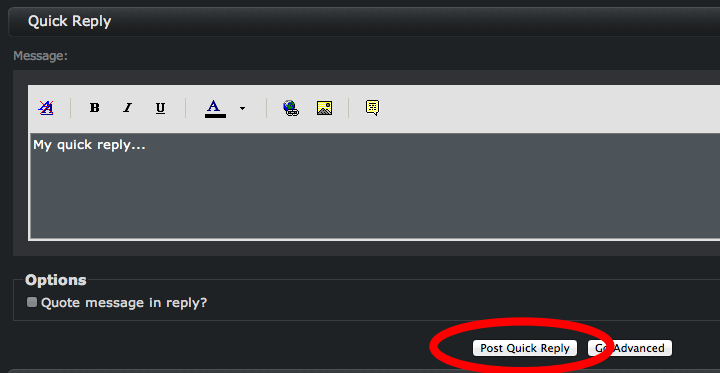 Quick Reply tells the forum which post you're replying to. If you also check the "Quote message in reply" box, then the content of that post will be quoted. It's easy to create a new thread. Looking for information? [post=1620133]Search[/post] before posting! In the appropriate forum, click on the "New Thread" button at the upper left of the page. Use descriptive titles so people know what you want right away. “I have a question” is vague. “How do I change my avatar?” is better. 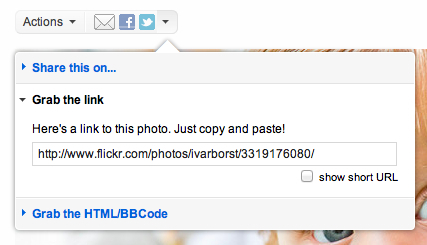 You can use the formatting options in the edit panel to add links, embed images, etc. Please do not use colors for your text. The default color is easy to read in both of our viewing styles. Changing the font color can make your post more difficult to read. When you are ready to share your post with the world, hit the 'Submit New Thread' button. If you're about to ask a question in a thread, stop and take a moment to read through it to make sure your question hasn't already been answered. You'll find the Quick Reply box at the bottom of every page of a thread. Type your reply in and click "Post Quick Reply" to have your post added to the end of the thread. If you would like to include a quote in your Quick Reply, then you must first click this icon to the lower right beneath the post you would like to quote. Then make sure that the "Quote message in reply?" box is checked. The post you've selected will be quoted in your reply. Quick Reply is missing a number of options that are available in the standard reply. If you wish to access those options after you've already started a Quick Reply, click the "Go Advanced" button, where you will have all the posting options available to you. The standard Reply button sits on the left side of your window at the top and bottom of any thread. This is the same as Quick Reply's "Go Advanced" mode. NOTE: Titles are optional for replies, and most people don't title their replies. When you are done, click on the 'submit reply' button. This button will open a new reply window and include the quoted text of the post you're replying to. NOTE: Only include the quote when necessary for clarity. Unnecessary quotes can clutter up the page making it more difficult to read. Be selective about how much of a post you're quoting in your reply. Sometimes you're going to want to quote many posts in one reply. Dgrin makes this easy with the multi-quote function. This icon will toggle on/off for each post you want to include in your reply: Click the posts in the order in which you'd like them included in your reply (each will toggle to green), and then click the reply icon. A new post will open with all the post quotes in it, ready for you to type your replies. If you want to embed an image in a post, first start a new post or reply. In this window you can type or paste the address to your image to be embedded. 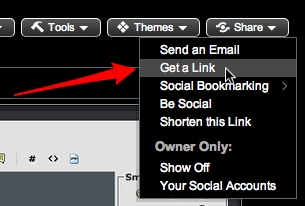 After you the link is there, simply click the 'OK' button! Hey, hold on.... that sounds simple but how do I find the address for the image? First, make sure you are logged in to your SmugMug account. Then, navigate to the image you want to embed. This will take you to another page. Make sure it is on the 'Photo Links' page. You'll see a list of several links, all for the same image but a different size. Find the size you like and click on the 'copy' button next to it. (If you are sharing photos on Dgrin, XL is usually a good size). This copies the image address to your computer's memory. Go back to the dgrin post/reply and paste the image address in the popup window (CTRL + V on a windows computer, CMD + V on a mac). Go to the image on Flickr. Select the address and copy it (CTRL + C on a windows computer, CMD + C on a mac). There are many other photo hosting services where you can store your images. Many of those have 'quick' ways of getting the image address. It is of course not possible to describe all the services but there is a 'general' way to get the address for an image. 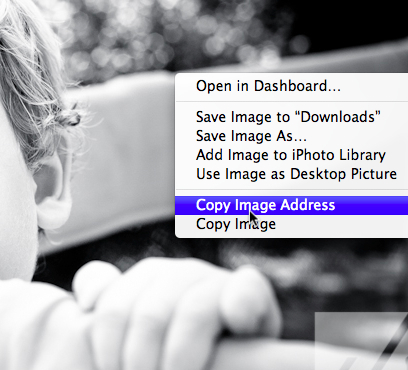 Select 'copy image address' (the exact words can be a little different in some browsers). Attaching an image is subject to some pretty confining limitations on size. You'll have to make sure that your image meets those limits before attaching. When you're embedding, the embed code takes care of the resize for you. It's much easier and preferable to embed. Attaching also applies pretty brutal compression to your images. Use attachments as a last resort. 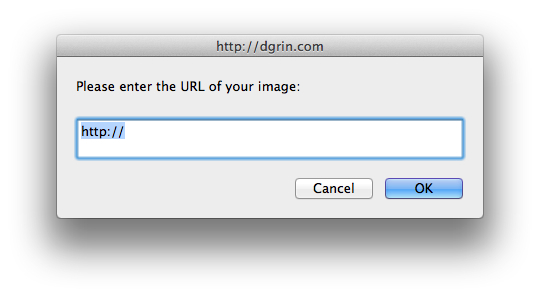 Dgrin will automatically resize any image that's too large to fit in your browser window. Images that have been resized have a small magnifying glass and the words "Full Size" under them. Just click to see the original image size, and then "Close" or click on the image itself when you are done. Edit Forum Options such as: Private Messaging, Email, Thread Display Mode, Timezone, etc. A great way to keep track of threads that you've posted in is to subscribe to them. Avatars are the images that appear next to your post and must be 80 by 80 pixels and under 19.5kb. You can create your avatar in the image editor of your choice. Make sure you use the "Save For Web" option in order to keep the file size within the acceptable limits. Dgrin's a great community filled with people who are happy to help. They're a great resource. But please search to see if your question has already been answered. It's important to search Dgrin, and the wider 'net via the search engine of your choice. Put the work in to finding your answer rather than ask others to do that for you. When you come up against a wall, reach out and the Dgrin community will be there for you. Many times people will post questions on Dgrin that could easily be found by a quick Google search. Simply copying the key phrase from their post into Google gets just the answer they wanted. Google search is the top box, and this allows you to use the Google search engine to search Dgrin. This can be helpful if you're searching for shorter terms (Dgrin doesn't index terms of 3 or fewer characters), or you simply want to search Google style. The other advanced Dgrin search options allow you to refine your search results. You can choose between a dark and a light theme to suit your preference. Look for the "Style" drop-down menu at the bottom of your screen. You can bookmark search terms for those things you do most often. For instance, if you're always checking the People, Journeys and House of Canon threads, you can make a search which will return all new posts in just those three forums. Each forum has an identifying number. You can find this number by going to the forum and grabbing the number after "f=". This would return all new posts for People, Journeys and Dgrin Forum Support. You can change "include" to "exclude" which will return all galleries except those listed. Warning: This will hide parts of Dgrin from your view. But that's kind of the point, eh? If you just never go into certain forums and want to hide them from your view of Dgrin, you can choose to exclude them in your Control Panel>Edit Options. If you change your mind in the future, just hit reset. Dgrin is as good as we make it. Unless it's obvious in the thread, don't hijack it by adding your photos. Please ask first. Ask before editing someone else's photos, even if it's the best way to illustrate your point. Shooting video? Check out our Action! forum.